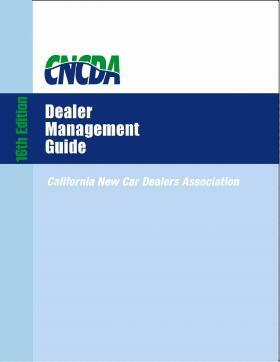 Our firm is the author of theCalifornia New Car Dealers Dealer AssociationManagement Guide, an extensive and detailed guide for dealers which is distributed by the California New Car Dealers Association to its members. The Guide, which is regularly updated, is approximately 500 pages in length, contains an in-depth discussion of the many laws and regulations applicable to California automobile dealers, and is widely used throughout California. See the link below to view the detailed Table of Contents for this publication. You can also view the Guide's index using the link below.